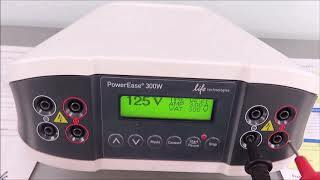 The Thermo Life Technologies Powerease 300 Electrophoresis System brings you a versatile and compact power source that’s fully programmable to meet your high throughput needs. This Electrophoresis power supply has a maximum output of 300V with three operating modes, constant voltage, current or power, and can be set in single unit increments. This power supply is microprocessor controlled with an easy to read display and can store up to 20 protocols, each with up to 10 steps. The Powerease can run up to 8 mini gels or 16 midi gels at once, with 4 sets of output jacks compatible with most electrophoresis devices. To get even higher throughput in the same place this electrophoresis power supply is safe to stack and is housed in flame retardant ABS plastic so you can keep your research going. This new Thermo Invitrogen Powerease Electrophoresis System has been fully inspected for functionality and is operating without issue. All of our lab equipment comes backed with our standard warranty. Should you have any questions, please don't hesitate to contact us.